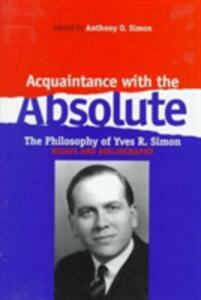 Acquaintance with the Absolute is the first collected volume of essays devoted to the thought of Yves r. Simon, a thinker widely regarded as one of the great teachers and philosophers of our time. Each piece in this collection of essays thoughtfully complements the others to offer a qualifiedly panoramic look at the work and thought of philosopher Yves R. Simon. The six essays presented not only treat some major areas of Simon's thought, pointing out their lucidity and originality, but also his underpinning metaphysics, so central to his thought. Rather than attempt to present all aspects of this patient, careful, and penetrating thinker, these essays select enough to situate Simon's philosophical excavations - especially his moral, political and action theory - among contemporary Thomistic philosophy. In defending philosophy as a valid way of knowing, Simon gives us an approach we can use to avoid contemporary dilemmas in the philosophy of science. Simon holds that philosophical truths both justify scientific method as a way of knowing the real and provide a basis for distinguishing what is ontologically significant in a scientific theory from what is not. This view allows us to avoid the apparently irrational conclusions of quantum mechanics without reducing scientific theories to being mere projections of our conceptual systems. Though aspects of some of the essays are suited for students of Simon's thought, the essays as a whole introduce the less familiar reader to this great thinking and, further, invite him or her to pursue Simon's own texts. The volume is enhanced by the inclusion of a definitive Yves R. Simon bibliography 1923-1996. The annotated bibliography is cross-reference in detail, revealing the astonishing variety of topics Simon treated.